ALL LEVEL FRIDAY 8 FEB- PM DRIVE - BADAYER!! 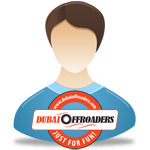 - Dubai Offroaders - Just for Fun! ALL LEVEL FRIDAY 8 FEB- PM DRIVE - BADAYER!! *** DO MARSHALS RESERVE THE RIGHT TO DENY PARTICIPATION OF ANY ILL-EQUIPPED OR UNSUITABLE VEHICLE! *** A FULL TANK OF FUEL IS A MUST! *** PLEASE READ YOUR OWNERS MANUAL AND GET ACQUAINTED WITH THE VARIOUS FUNCTIONS OF THE DEVICE AND MOST IMPORTANTLY HOW TO MANUALLY INPUT A FREQUENCY!! *** ANYONE WITHOUT A PROPERLY CONFIGURED RADIO, WILL NOT BE ALLOWED TO JOIN THE DRIVE, FOR SAFETY REASONS! a) Ensure your 4 x 4 vehicle is in perfect condition and with enough fuel. b) Carry an auto air compressor with you and ensure it’s in working condition. d) Carry all necessary offroad gears, in good condition. e) Carry enough water / refreshments / re-hydration drinks for self & co-passenger(s). g) Make sure that your spare tyre is in workable condition. h) your vehicle must have front and rear tow points. Re: ALL LEVEL FRIDAY 8 FEB- PM DRIVE - BADAYER!! Is the drive open to join now?